Ciao! I like the name frolicking Fridays, even a bit more than fabulous Fridays. There is no guarantee of fabulism when one is frolicking. Frolicking is a state if being, of pursuing novelty and adventure---for better or for worse. Fabulous may or may not happen... but it is worth the search! This Friday, James and I took the day off. We are now trying to be tourists on Fridays---while the kids have long school days. (Mon and Fri they have school until almost 4pm; Tue/Wed/Thurs school only goes until 1pm). We reserved a tour for this past Friday: the Secret Passages of Palazzo Vecchio. The Palazzo Vecchio is a building adjacent to the Uffizzi Gallery, and is also known as the Palazzo Signoria. This was a tour worth attending; it was about 1 1/2 hours and our tour guide was wonderfully knowledgeable and engaging. You can buy tickets right online, or pick them up inside the Palazzo at the ticket office (biglietti ufficio---which is where you meet to begin the tour). We walked secret passages in the Palazzo, and saw rooms hidden from the public's eye. The most notable was Francesco Medici's studiolo. It is shaped like a treasure chest, with paintings all over the walls and ceilings. The paintings had specific themes; there were 30 paintings in the room, commissioned by Vasari. Many of the paintings were actually fronts for cupboards or passage-ways. James and I also tucked into Palazzo Davanzati, a museum of a renovated medieval aristocratic palazzo. They offered guided tours only (in this case: yawn). It was interesting for about 10 minutes, but the tour was over an hour long. We wouldn't recommend it. 1. Print shop (etchings) called L'Ippogrifo on Santo Spirito. She loved the lobsters (saw them!) and I fell in love with some of the fish prints---and one of Pinocchio. I actually bought a similarly fashioned print weeks ago at an outdoor market. (Picture of me in front of shop). 2. Hotel Lungarno. It is a hotel with multiple venues. She loved the bar on the oltrarno side (cozy white couches); we liked the bar on the florentine side. Hers has a better view, especially for a rainy day. Ours is outdoor and swank---perfect for a sunny day. 3. S.A.D.A. 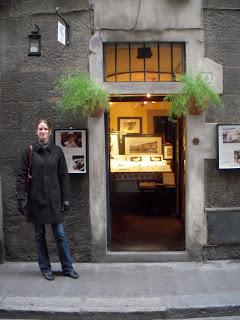 jewelry shop on the Ponte Vecchio; we saw it but I didn't find the exact rings she had found (sorry K!). It is fun to stroll across the bridge, to peak at all the jewelers. Fun fact: the bridge used to have butchers and leather tanners, but the smell was offensive to regular passerbys so at one point they were pushed out and replaced by jewelers. 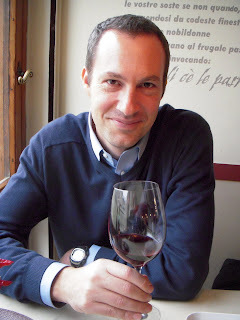 When checking out the Hotel Lungarno (oltrarno side), we opted to grab wine and olives at the trattoria next door named L' Ristoro (via San Jacopo 48r). I recommend it for lunch or grazing: you very nearly feel like you are in someone's home---in a relaxed cozy atmosphere. It is super casual but the food is just what you would hope to find: wine by glass or liter, with olives, sliced meats and cheeses---or a little lasagna, salad and piled bread if you are hungrier. Share, chill, visit. We did, and it was great. Thank you so much for sharing your wonderful adventure - I love reading all of it!